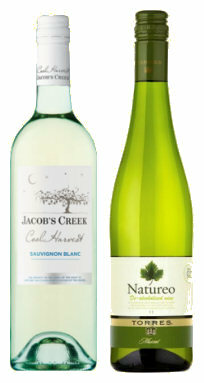 Reduced alcohol wines tasted. Are they any good? Alcohol levels in wine have undoubtedly crept up, with the average today probably running around 13.5% alcohol by volume (ABV). This has been an inevitable consequence of warmer wine regions coming on stream. Many regions in the New World enjoy more sunshine and heat than traditional European vineyard regions, which means extra ripeness and extra sugar in the grapes when they are harvested. It is sugar that is converted into alcohol by fermentation, so sweeter grapes means higher alochol wines. Pursuing the flavour profile of wines from these warmer climes, even traditional European wine producers began to harvest later to achieve similar ripeness levels, and thus more alcohol in their bottles too. With government guidelines on safe ‘units’ of alcohol just one factor influencing a move towards healthier lifestyles, producers and retailers have not been slow to tap into this new mood and the category of low alcohol wines is growing. Market analyst Nielsen published data to the year ending May 2012 showing that the reduced alcohol wine category is already worth £22.7 million and saw 40% growth. Lower alcohol wines as a category now outstrip countries like Argentina in sales. At its most recent press tasting Tesco showed a whole range of non-alcoholic and low-alcohol wines, from the 0% to around 9% ABV. Unlike naturally low alcohol wines which come from cool climates and which leave some of the sugar unconverted so they are off-dry – like many German Rieslings or Italian Moscatos – these wines have their alcohol reduced using technology (machines which filter or vaporise alcohol out of the wine) and often blending unfermented grape juice to dilute the alcohol in the wine. The wines shown by Tesco – some featured in my 2012 Rosé round-up – included a relatively new category of “aromatized wine products,” basically laboratory-created concoctions that, as a wine lover, I found abhorrent. 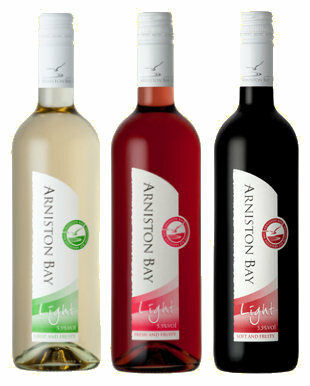 So when the South African company Arniston Bay contacted me to say their newly launched range of ‘Light’ wines was offering something of real quality, I agreed to taste the range. All are in Asda at 3 for £10 currently. A couple of bottles in my samples rack also fitted the lower alcohol theme, so I have included them in this report too. Described as being made from “100% wine based components with no added water and no added flavourants,” these wines all come in with 5.5% alcohol and around 30% fewer calories than equivalent wines from Arniston Bay. No grape varieties are specified on the labels or the company web site, but in fact this is a blend of Chenin Blanc and Chardonnay, with 36g/l of residual sugar (although described as “crisp and fruity” on the label). There’s some peach to the aromatics, but it is fairly neutral, leading on to a palate that is indeed actually fairly crisp albeit sweet on the mid-palate, all that sugar being offset by decent acidity. It has pear and apple fruit and decent balance overall. 84/100. £4.98, Asda. With an even higher 50g/l residual sugar, this is a blend of Chenin Blanc and Merlot. The nose again lacks a little aromatically, just hinting at some redcurranty fruit. On the palate the sweetness is certainly more persistent, the palate having a soft strawberry pulp character and something just a touch herbal too. There is enough acidity to stop this from being cloying, and it is fresh and well made. 83/100. £4.98, Asda. The same analysis as the white, with 30g/l of sugar and 6g/l total acidity, this Cabernet Sauvignon and Merlot blend is a fairly pale colour and has the most aroma of the three Arniston Bay wines, with some rich red fruit aromas and a touch of earthy spice. In the mouth the sweetness sits less happily for me, and there’s a sense of dilution to the wine as it finishes, which is perhaps inevitable given the style. It is drinkable enough. 82/100. £4.98, Asda. Miguel Torres told me Natureo has become his regular tipple if drinking during the day. With only 0.5% ABV, it is made from 100% Moscatel and goes through a special technology that removes the alcohol from the wine. A glass has around 15-20 calories, which is around a quarter of a normal wine. Given the grape variety this is suitably floral and perfumed on the nose, grapey Muscat aromas and some lychee-like fruit. On the palate it is not quite dry, and that quite tropical fruitiness gives some character despite a very light texture and mouthfeel. With a tangerine burst of bright acidity it does not taste particularly wine-like, but has plenty of character. 84/100. £5.99, Waitrose, Asda. This, harvested from cooler regions at night to retain maximum freshness, comes in with a feather-weight 10.5% ABV so seemed like a good candidate to include here. A little squirt of Cº2 at bottling adds to the impression of liveliness here, the nose offering some lemon sherbet aromatics and a touch of background herby punch. On the palate this is light and flavoursome, with good Sauvignon grassiness and cut, again an impression of a little residual sugar, but plenty of cleansing apple acidity. 85/100. £7.98, Asda, but note this is planned for ‘roll-back’ to £5.98 from 23rd August through 4th October 2012, Waitrose.